Well, lets stop idealizing about what could be and get practical about getting healthy. Here are some suggestions for obtaining and MAINTAINING a healthy lifestyle in Hong Kong. They do say breakfast is the most important meal of the day, it is also the one meal that tends to overlap with my sleep cycle... So we all know something has to be done. Meal prep. If you have healthy and yummy meals prepared, there's no reason not to make a healthy choice. Although the idea of meal prepping can be overwhelming and time consuming, you'll be happy you did. Two of my favorite things to prepare in advance for breakfast are Overnight Oats and Smoothie Bags. Both of these can be made however you like! I love to make a big batch of Overnight Oats and eat for the week (tossing a smoothie in every so often to switch things up!) I love mixing my oats with a mashed up banana, chia seeds, shredded coconut and a bit of coco powder and honey then topping the whole bowl (or container) with regular, almond or coconut milk! Place it in fridge overnight and you're good to go! If you're a smoothie fanatic (like myself) but can't bother to get up 10 minutes earlier to fire up the blender, fill Ziploc bags with all your favorite smoothie fillings. You can use fresh or frozen fruit, spinach and even yogurt if you like! Pop these bags in the freezer and your ready to go! Come the morning, break up the frozen bag, toss it in the blender add in protein powder (if you like)and your favorite juice, water, milk or coconut water! I love this breakfast when I'm running out the door in the morning! Here is the link to My Favorite Green Smoothie! I like to substitute the Greek yogurt for half of an avocado and a big scoop of protein powder! With lunch being my prime time to hit the gym, I do my best to prepare my lunches in advance. All I can say is BATCH COOK. Now I used to tease my co-worker about his batch cook fettish, and yes I am now eating my words. He inspired me to start making a big batch meal on my day off, then I'm set for the week! If you find you're sick of it half way through the week, freeze it! My absolutely favorite meal to batch cook is Quinoa Chicken Chili. It's so filling and amazing on its own or on top of a salad! This past week I made a Pumpkin Chili which was also fantastic! I try to make things that I know can survive the freezer because I notoriously get sick of whatever it is I've cooked about three meals in. I'll be honest, after a long day of work, I find myself eating out all the more often. As we all know, Hong Kong is crawling with restaurants, and no they are not all dumpling and dim sum heavy, make it your mission to find your favorite healthy dining restaurant! My personal favorite is MANA! Slow Fast Food. Having moved from Canada to the 852, I quickly realized that most grocery stores are in fact NOT the size of shopping malls. Hong Kong is not exactly the place for one stop shops, that being said, shop around! Get to know your neighborhood and find where is best to find your fav ingredients (not to mention prices can majorly vary). With small grocery stores being located practically on every block there's no reason not to shop around! Looking for fresh cheap produce, the wet market is a perfect place to start. 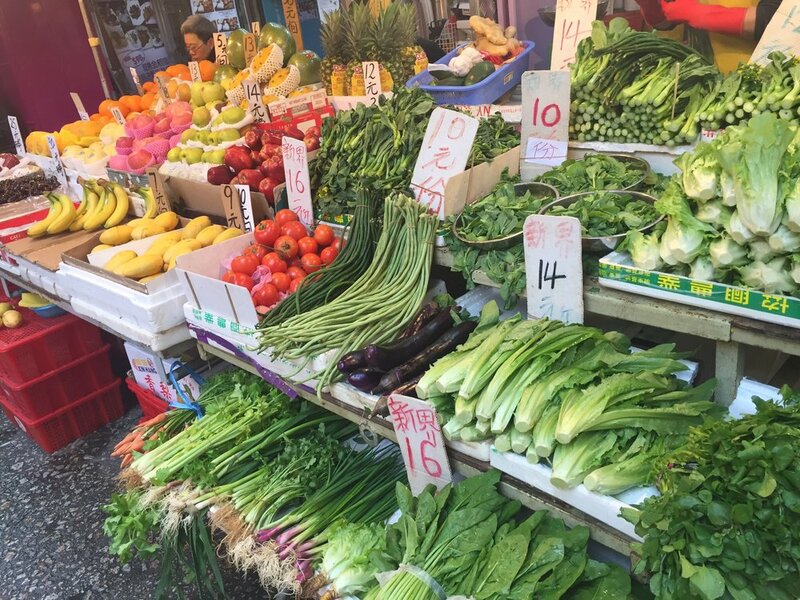 With everything from purple sweet potato to Japanese pumpkin, the wet markets definitely have a wide variety of fruits, veggies and who knows what else! Having a wet market just a block away from my house, I find myself wandering there on my day off! Its the perfect place to shop on a beautiful day and get prepared for the upcoming week. Anybody care for healthy snacks delivered to your home or office? I certainly do! Having been signed up to Greenberry Snack Delivery for the past three months, I am always delighted to have healthy snack on hand at the office! My roommate has recently signed up for Chewswize which has also been fantastic! Into fresh juice or juice cleanses? Hong Kong is crawling with awesome options for healthy sips. With amazing cleanse options from Genie Juicery and delightful afternoon sips from Catch Juicery to name only a few, there are definitely a plethora of ways to drink in your daily nutrients! With eating out being so accessible in Hong Kong, it's important to not beat yourself up when your veer off the healthy path. For those of you who haven't heard of the 80/20 rule, live by this. 80% healthy and 20% cheat eat! Come on, we all need room for an egg waffle... Or two. So dieters, hopefully these tricks can help you kick at least one of those unhealthy habits! And friends, believe me, there's always room for a few dumplings here and there. You stay hungry Hong Kong! And remember... Your diet starts tomorrow!